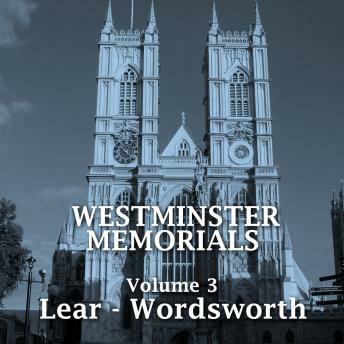 Westminster Memorials - Volume 3 - An introduction. Westminster Abbey has seen much during its long, rich history; the coronations of Kings and Queens, the burials of Prime ministers. However it is also a church that remembers the men and women of the arts. Dedicated writers and poets who spoke so eloquently that the Nation wished to remember them with plaques upon its walls so that all who travelled here could remember too. Their works are worth remembering and here, in these volumes, their wise words speak too and for us all. In Volume 3 we collect together Edward Lear to William Wordsworth.